Landaas & Company newsletter November edition now available. The consumer remained a bright spot for the moderately growing U.S. economy in September as personal spending rose 0.5%, outpacing the 0.3% gain in income. The personal saving rate decreased slightly as a result to 5.7%, the Bureau of Economic Analysis reported. Year-to-year, the spending rate stayed at 2.4% – the same as August but down from 2.9% in June and July. Consumer spending accounts for about 70% of U.S. economic activity. In the same report, the Fed Reserve’s favorite inflation indicator stayed at an annual rate of 1.7% for the second month in a row. The rate has stayed below the Fed’s 2% target since 2012. The ISM Manufacturing Index suggested the sector continued expanding for the second month in a row in October, although new orders – a leading indicator – grew at a slower pace. Production, employment and export orders quickened, according to the Institute for Supply Management, and purchasing managers in 10 out of 18 industries said their business was expanding – despite ongoing resistance from slow global economic growth. 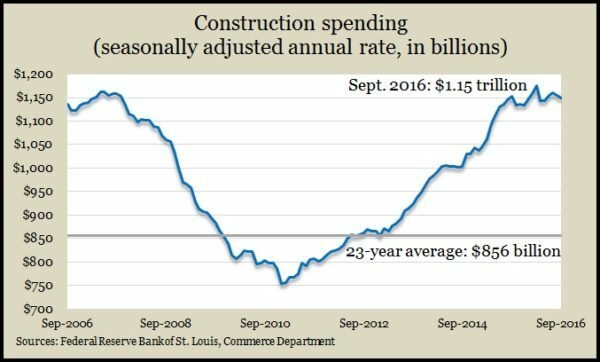 The Commerce Department said construction spending declined in September. The annual rate of spending fell 0.4% from August and was down 0.2% from September 2015. Residential construction remained steady, but public projects fell for the third month in a row, representing a 7.8% spending decline in the last year. Still, overall construction spending remained above pre-recession levels. Another key sign of consumer spending is the number of motor vehicle sales, which rose in October. Dealers sold at an annual pace of more than 18 million cars and trucks in September, according to Autodata Corp. That was a 1.5% increase from the September rate but 0.9% behind October 2015. Truck sales continued to outpace cars as vehicle sales overall remained above the pre-recession level. As expected, the Federal Reserve’s policy-making committee declined to nudge the overnight rate but cited evidence suggesting an increase is possible at its next meeting Dec. 13-14. In its statement, the committee said the U.S. economy is warming up from where it was in the first half of the year, with solid job gains, moderately rising consumer spending and inflation rising, though still below target. Non-manufacturing industries, which directly account for about 90% of the U.S. economy, expanded for the 81st month in a row in October. According to the Institute for Supply Management, non-manufacturing companies reported slower growth, below analyst expectations, although at the average rate for the last 12 months. Purchase managers expressed optimism in the business climate as well as the direction of the economy. The moving four-week average for initial unemployment claims rose for the third week in a row following its lowest level since November 1973. Labor Department data showed jobless claims remaining 28% below the historical average, suggesting continued reluctance to let workers go, which supports a stronger employment market. An approximation for business investments advanced in September, for the second month in a row, according to a Commerce Department report on factory orders. Orders overall rose more than expected from August, though at a milder rate than in the previous two months. Pulled down by business uncertainty and a global slowdown, factory orders fell 2.3% from the same time last year. U.S. productivity improved in the third quarter for the first time in a year and at the fastest pace in two years. The Bureau of Labor Statistics said economic output increased at an annual rate of 3.4% while hours worked rose 0.3%. Year-to-year, though, output per hour remained unchanged from the third quarter of 2015 and continued to lag the 2.2% average productivity rate dating back to the end of World War II. Lack of productivity slows economic growth and advancements in the standard of living, which fuel corporate earnings and worker pay. U.S. employers continued adding jobs at a steady pace in October, although not as many as analysts expected. According to the Bureau of Labor Statistics, the closely watched employment situation report showed payrolls expanding by 161,000 jobs, down from an average of 181,000 so far this year. In a sign that tight hiring conditions might be pushing up wages, average hourly earnings rose 2.8% from the year before, the highest increase since July 2008. The unemployment rate dipped to 4.9% and has been around where economists consider “full employment” for 14 months. The U.S. trade deficit narrowed in September to its smallest gap since February 2015. With exports rising 0.6% and imports declining 1.3%, the deficit declined more than expected to $36.4 billion, according to the Bureau of Economic Analysis. Exports rose to their highest point in 14 months, an encouraging sign for U.S. manufacturers who have been beleaguered by weak global demand and unfavorable currency exchange rates.